Found only in Num. xxxiii. 49; but Ha-Shittim ("The Acacias"), evidently the same place, is mentioned in Num. xxv. 1, Josh. iii. 1, and Micah, vi. 5. It is clear from these passages that this locality was a town, or perhaps a district, of Moab, which was the final headquarters of Joshua before he crossed the Jordan. Josephus ("Ant." iv. 8, § 1; v. 1, § 1) states that there was in his time a town, Abila, full of palmtrees, at a distance of sixty stadia (seven and one-half Roman miles) from the Jordan, and describes it as the spot where Moses delivered the exhortations of Deuteronomy. Robertson Smith may be right in identifying it with the modern Khirbet-el-Kefrein (Cheyne, "Ency. Bibl. "), where ruins still exist. There is to this day an acacia grove not far from the place, although the palms mentioned by Josephus are no longer there. In I Sam vi. 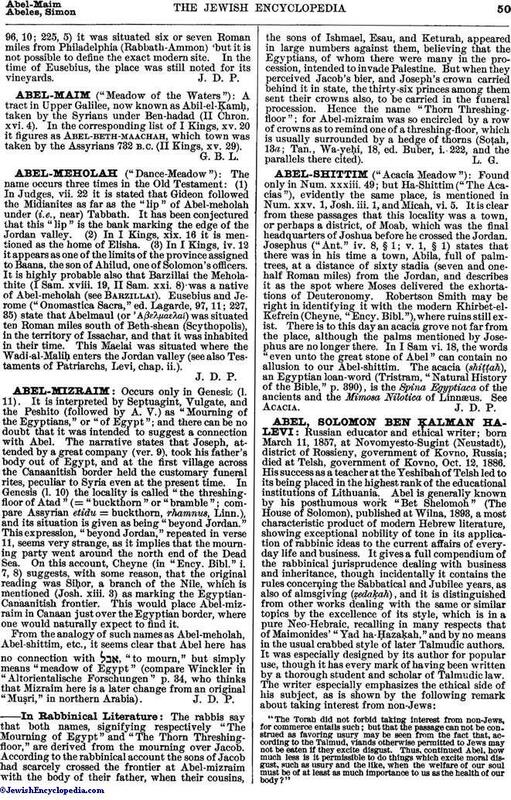 18, the words "even unto the great stone of Abel" can contain no allusion to our Abel-shittim. The acacia (shiṭṭah), an Egyptian loan-word (Tristram, "Natural History of the Bible," p. 390), is the Spina Egyptiaca of the ancients and the Mimosa Nilotica of Linnæus. See Acacia.